I thought I would like this book so much more than I did. 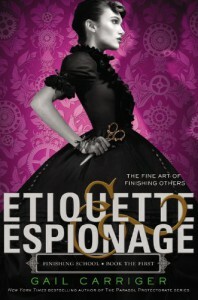 I've heard great things aboutGail Carriger's Soulless and I'm still willing to give that book a shot, but Etiquette & Espionage did not keep my attention. Sophronia was a little boring and shallow. She barely showed any emotion. There wasn't any real romance in the story, which is fine, but she could have had feelings about something. The world had so much potential, but it was very under-developed. Why are all of these spies and assassins needed? Who will they work for? Where do the flywaymen come from? What side are they on? And who makes up the other side? It shares a world with Soulless, so maybe the author did more world-building there and was expecting people to read that series first. I would have been much more interested in learning about the big-picture stuff rather than Sophronia's antics.